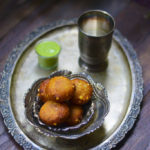 Sabudana Vada |Sabudana Tikki |Navratri Fasting Recipe is a fried dumpling made with tapioca/sabudana and boiled potatoes as main ingredients along with crushed peanuts and spices and condiments. Prepared and eaten in most parts of the country during Navratri Fasting/ Vrat or during any fasting. 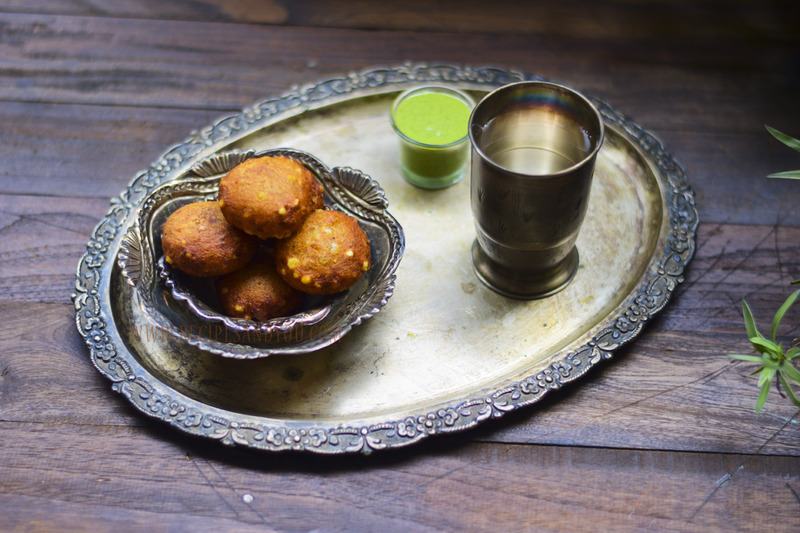 Sabudana Vada & Sabudana Khichdi are two recipes that I always make during my fasting days in Navratri. Easy to prepare and you can have them with either yogurt or homemade vrat green chutney .Sabudana Kheer is the third one made with sabudana /tapioca which I never miss to prepare. Navratri comes twice a year, once in March and then in September-October every year. During these Navratri Fasting, any grain flours are not consumed. Only a fruit based diet is followed which includes buckwheat flour, water chestnut flour, amaranth/rajgiri flour, samak rice flour / samak rice. Only a few vegetables are consumed like potato, tomatoes, pumpkin, Arbi with a no onion no garlic meal prepared once or twice a day as per preference. I like to experiment and try and have new dishes prepared with these few flours and vegetable to not get bored of the flavors, but then a few traditional recipes you just cannot miss.One such recipe is Sabudana Vada. Tapioca / Sabudana being a very commonly used ingredient and easy to prepare had its special place in our traditional recipes .Originally it came from Maharashtra, where people make it not only during fasting days, but also as a everyday snack. Sabudana Khichdi, Navratri Mezze Platter with dips, Vrat Dosa , Kuttu ki kachori, Samak rice kababs, Pumpkin Appe, Pumpkin Tortila Chips, Peanut Dip, Tomato chilli dip. Fasting Desserts : Sabudana Kheer , Khoya Barfi, Khoya Badam Peda . 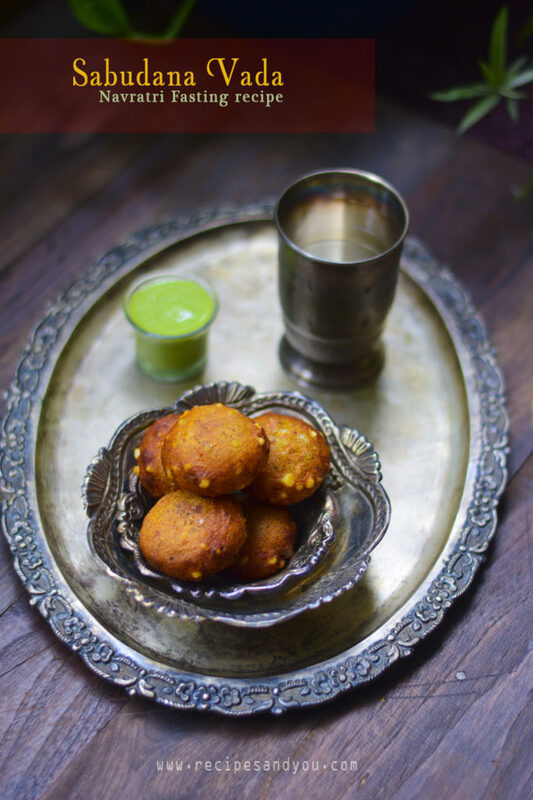 Sabudana Vada |Sabudana Tikki is a fried dumpling made with tapioca/sabudana and boiled potatoes as main ingredients along with crushed peanuts and spices and condiments. Prepared and eaten in most parts of the country during Navratri Fasting/ Vrat or during any fasting. In a bowl, put ½ cup sabudana and ½ cup water. Remember water should be just enough to soak till the tip and not extra otherwise the sabudana will get soggy and will retain excess water and the vadas will break while frying. Soak this and keep aside for 2-3 hours or overnight in the fridge. Next, in a large bowl, mix together, soaked sabudana, boiled and grated potatoes, roasted and crushed peanuts, chopped green chillies, sendha namak/rock salt, black pepper powder, powdered sugar and lemon juice. Mix and mash this mixture well with your hands until everything comes together. Now, make small dumplings/cutlets/tikkis/vadas of this mixture with your hands and keep them aside covered. Heat oil in a kadai/wok, bring it to boiling hot temperature and start putting the vadas into the oil to fry. Fry them evenly on both sides ,turning them as needed. This recipe sounds very tasty and flavorful! Yum! I have never heard of these before. I am all about trying new foods, and I certainly would give these a try….they sound delicious. thanks Gloria. Am glad you liked the recipe. Do try, am sure this will stay on your recipe list forever. I’d love to try these with the yogurt and the vrat green chutney. Can you send me a link to the vrat green chutney recipe? I have not posted the green chutney recipe as of now. But you can just make it in the grinder with: coriander leaves, mint leaves, yogurt, ginger, green chili, roasted peanuts, black salt/rock salt, black pepper(optional),lemon juice.I can mail you the full recipe if you with with measurements. It’s fun to learn about other people’s cultures! I’ve never heard of these and they sound absolutely delicious! Thanks Elaine. 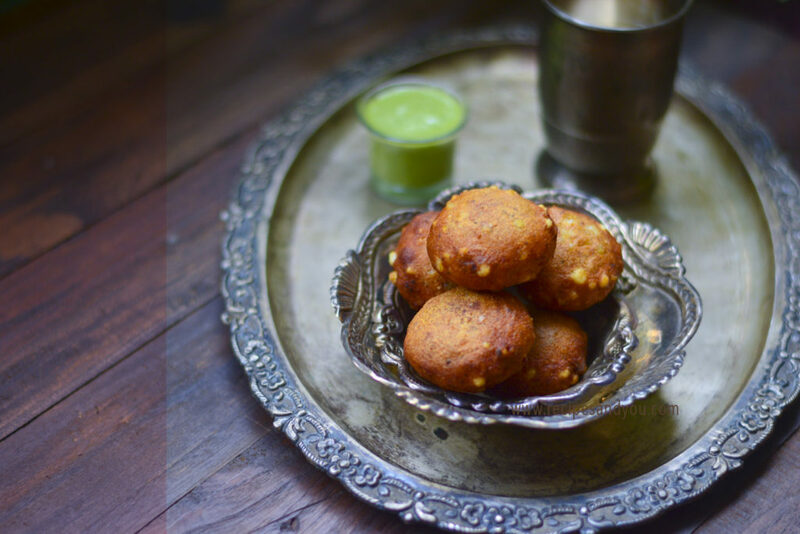 These are usually made in India during Fasting Days or Navratri Fasting as we call in India. During this time, we only take a fruit based/gluten free diet. So potato, tapioca, amaranth flour/ buckwheat flour, pumpkin are few ingredients we cook our meals with. Hope you like it. These look delicious, and I appreciate that they are grain-free too! I think that they would make a wonderful accompaniment to a stew. Thanks Jenni. Glad you liked. Yes they are grain free. Yes they’ll pair wonderfully with stews. Veena, although i too make them mostly during the Navratri Fasting days, but these are a very healthy and easy to make snack. My kids love them. Since Tapioca is available all year, this is a frequent Tiffin box filler for my son. You had me at fried. I’ve never had potatoes with peanuts before for it sounds like a great combination. Thanks cheryl. They are delicious indeed. Hope you try them soon. I’ve never heard of these before, but I’m sold! Between the filling and being fried, I feel like these would be the perfect side to a thick, hearty stew. Thanks for sharing! I can’t believe these are gluten free! These look amazing and your pictures are beautiful! The ingredients are unique and I’m excited to try this one!! What a gorgeous recipe! I’ve never had anything like that and I am so willing to try! We have tapioca flour is it the right one? Thanks!